041610PBDN 4 photos art by Rene von RIchtofen. This untitled work from 2008 is a playful take on von Richthofen’s passion. His works make a metaphorical statement about social and cultural issues, from global warming, to war, to racism. Rene von Richthofen has always been fascinated by automobiles. As a 5-year-old living in Austria, he began to collect toy cars. 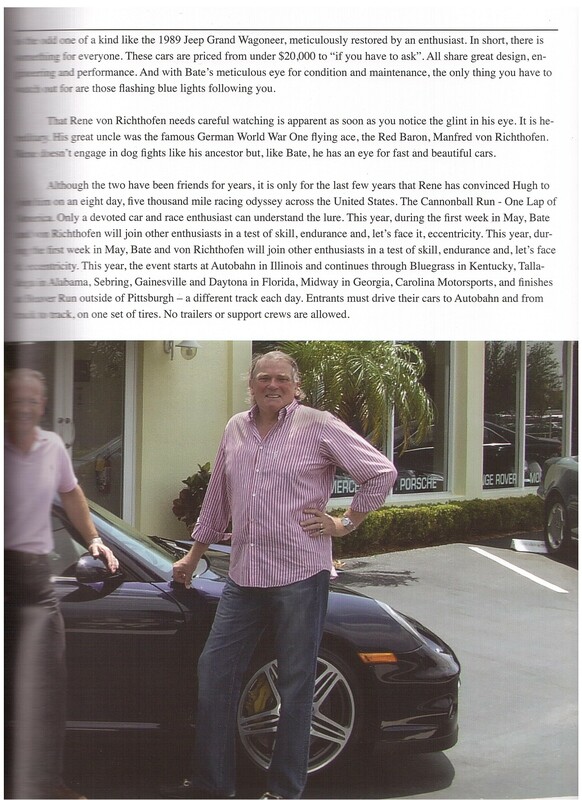 At 16, he competed in Austrian Hill-climb racing with his first car, a Mini Cooper S.
Although he is still racing as a hobby, von Richthofen now combines that passion with the design of automobile art begun in the 1990s when he lived in Palm Beach and created collages out of car photographs. He also collected Matchbox cars, finding them on the Web, in friends’ attics and at stores around the world. A descendant of Manfred von Richthofen, the World War I fighter pilot, aka Red Baron, who shot down 80 aircraft before he was killed in action on April 21, 1918, von Richthofen’s artwork makes a metaphorical statement about social and cultural issues from global warming, to war, to racism. Sometimes these themes are combined into installations that feature automobile spare parts, children’s toys and model cars. 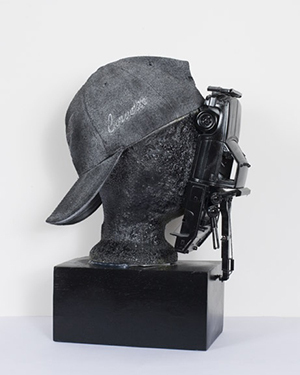 Each piece is unique yet easily identifiable as one of his works. A well-known raconteur who also owns the auto art styled Great Wraps restaurant in West Palm Beach with Manus, von Richthofen creates clocks, coffee tables lamps, hanging objects — such as colorful masses of tiny cars — videos of street signs flashing with old photos of cars, sculptures of trucks, etc. He uses such found objects to make a statement. The artist works most days from a single-family home that he bought near his condo in West Palm Beach for the purpose of having a studio where he is not bothered by outside influences. With no radio, TV or kitchen, he can arise early and concentrate on tire rims, metal parts, seats, wheels and generators, spending his days ensconced in auto parts. Von Richthofen comes from an artistic background in Austria. He was born in the charming city of Salzburg where his mother, Ingrid von Szamwald, was a professional photographer with the oldest studio in town. She was a colorful character who loved to film artistic superstars when they came to town. After attending German and Austrian boarding schools, von Richthofen graduated in 1971 from the University of Innsbruck with a degree in business law and economics. For the next two years, he completed a training school at his family’s Leica Camera and Leitz Microscopes in Wetzlar, Germany. He became a product manager for EISA (Education, Industrial, Scientific and Audio-Visual) and represented his family’s business interests, eventually learning the ins and outs of national and international marketing and sales, which he liked. In 1981, he moved to Palm Beach to work with Rodney Dillard, the head of Sotheby’s. He was placed in the commercial real estate area and eventually took over the department, working there until 1986, the year he met Manus at the annual Gemini party hosted by Palm Beach preservationist Bob Eigelberger. He also raced cars at various national events when he wasn’t working. In 1991, he founded GolfUniverse.com, a golf information Web site that he sold seven years later so he could delve into an auto-racing site, more to his liking. He also took driving classes in Sebring. 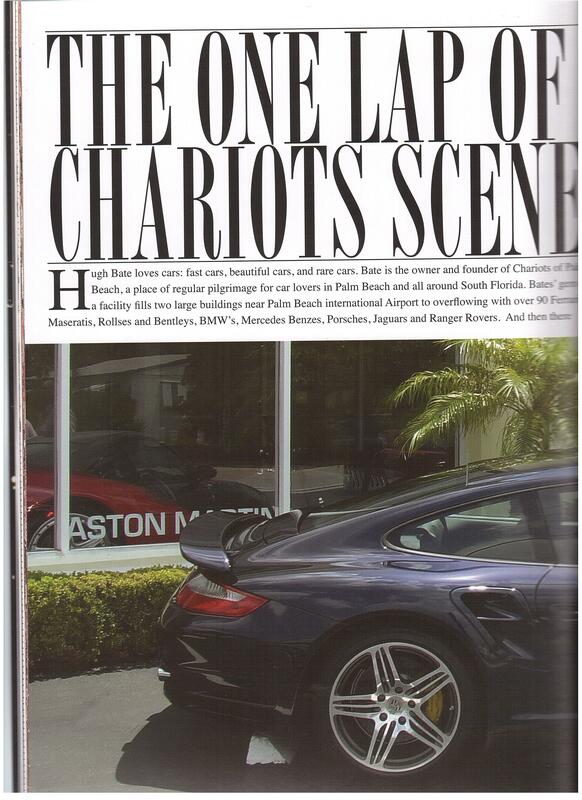 In May, von Richthofen will make a one-week run in a blue Porsche with Hugh Bate, owner of Chariots of Palm Beach, a favorite stop for car lovers, and the scene of von Richthofen’s first auto art show last spring that drew thousands of people and sold 14 pieces. His second show was in late November at the Steve Johnson Gallery Space on Dixie Highway. 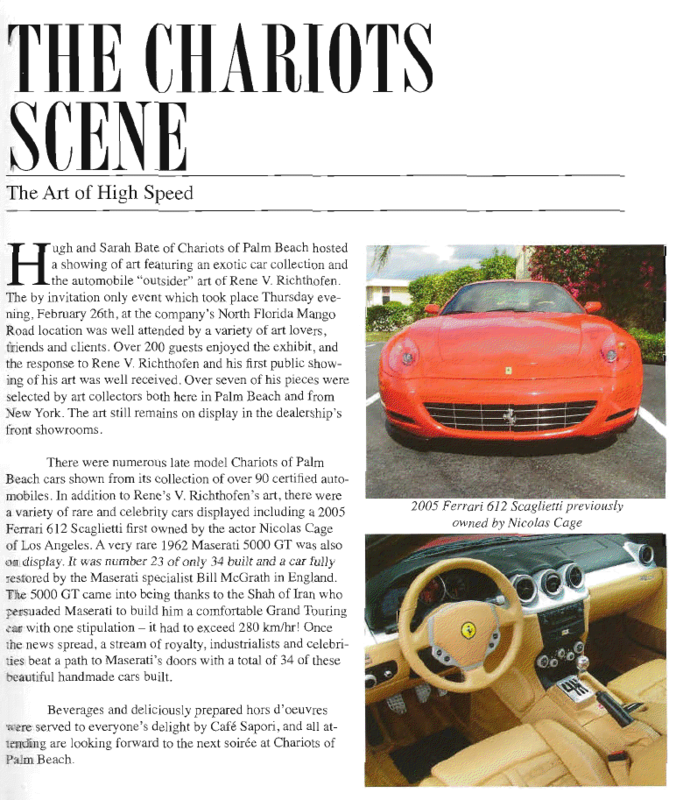 From May 27-June 30, his auto art will be part of a group exhibition in Boca Raton’s Karen Lynne Gallery. In addition to Mordes, some serious auto art collectors have bought work from von Richthofen. 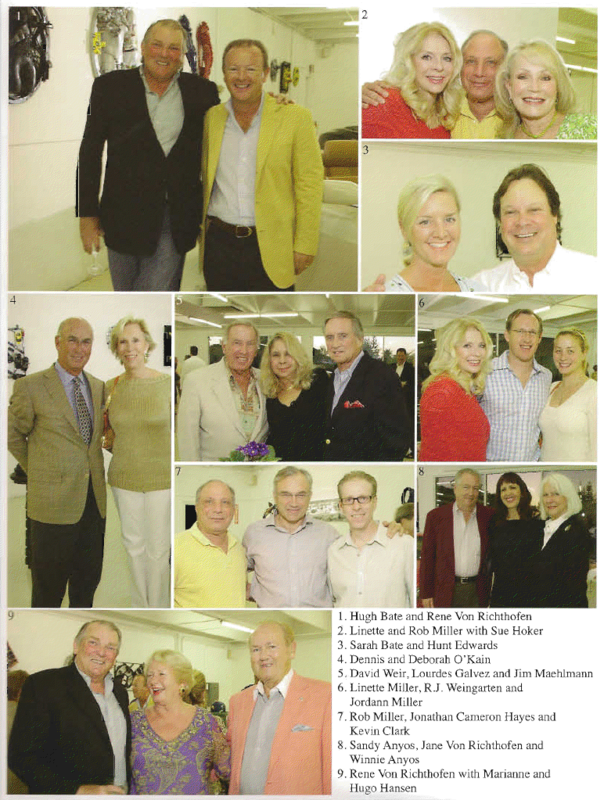 Jerry and Vivian Bregman of Miami and New York are well-known collectors and have become clients. Charles Lazarus, of Toys ‘R’ Us Inc., has a whole wall of his Hampton home filled with von Richthofen’s auto art. And for the owner of Fruehauf Trucks, who lives in Palm Beach and Michigan, von Richthofen designed a replica of a truck. Most of the time, he has about 50 works of art lining his studio and hopes to show more pieces around the world through gallery representation. His prices vary but a 6-foot-tall lamp with mirror sells for less than $2,000 for both pieces. Like racing cars, creating art requires skill, endurance, drive and some eccentricity. Von Richthofen has found his bliss, showing his mettle, one pedal at a time.